Here at I Love Halloween, we're all big fans of The Simpsons, television's longest running animated comedy, and there are no better episodes than the Treehouse of Horror Halloween episodes! Like us, you probably spent plenty of hours watching reruns of the show, so we've cooked up a little challenge for you. Below are different images from each episode and we bet you can't remember the quote that goes with each image! Answers are below, but no cheating! Scary, huh? What about this one! Poor guy looks like he's having a rough day! What about this one? Terrifying, n'est pas? Well, let's continue on! They seem happy! Nothing sinister there. Let's continue, shall we? Oh Krusty, you continue to delight with your antics! Just a couple more, folks! Which of these images did NOT actually come from a Treehouse of Horror episode! 1) "Bart, you wanna see my new hockey mask and chainsaw!!" 3) "Y'arr, this chair be high, says I." 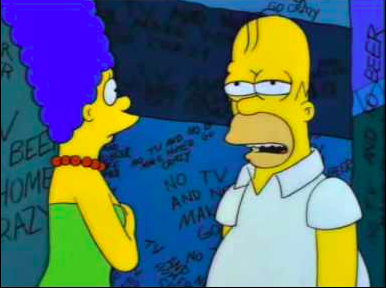 4) "It says 'no TV and no beer make Homer something something . . ."
5) "To enter, send me your parents brains. Or write 'Parent's Brains' on a 3x5 card and send it to . . ."
6) Shopkeeper: Take this object, but beware it carries a terrible curse! 7) "I don't understand it. James Coco went mad in fifteen minutes!" Bonus Question: The first image is from the episode Cape Feare, which features the return of the deranged Sideshow Bob.